Discussion in 'Maintenance, Tinkering & Embellishment' started by Twentytwentyprojects, Apr 16, 2018.
https://www.flickr.com/photos/[email protected]/shares/770H1w My wife dropped our kitchen knives, including 2 older knives my grandfather gave me, off at a cutlery and sharpening shop. Apparently he told her the knives might get scratched by the procedure he uses to sharpen knives. She didn’t think to ask me if that was ok as she assumed it would be within reason. When we received the knives back, they are all sharp but have a line of scratches up the blade of each of them. 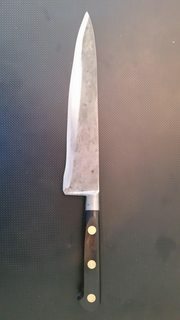 2 are Henckels professional and a shun plus a cutco and the heirlooms. Is this normal? What machine was used to do such damage? It looks like a bench grinder was used because the bevel is no longer straight. Is there a way to fix this? I realized after the fact that these companies all offer sharpening services but now that the damage is done they can no longer help. I can't say what was done to ruin those blades but for repair I think is possible just not sure what the cost will be to the knives or to your wallet. I would speak to a true professional sharpener about it and that might could be used to make the "professional" sharpener pay for the damage. I doubt he will pay for the damage. He warned the OP’s that the knives could get scratched during the sharpening process. When taking your knives to be sharpened it is important to check out the method the sharpener is using. Best bet is to go to a reputable sharpener. There are many on bladeforums that will do it for you. @Lapedog I doubt too but I would say there may have been a misrepresentation of the damage because it sounded more like like scratching and what is shown is just a nightmare. that looks horrible. I expect a professional to do better. - if using a bench grinder and you don't know how to do by hand I expected a guided bench grinder. Am I wrong about these assumptions? This company says they’ve been in business doing this for 50 years down here in miami. I just can’t understand how they could still be in business. I usually hand sharpen my knives but have not had time and thought I could get a good factory type edge back on them. I spoke with cutco and Henckels who both reminded me they offer a very reasonable sharpening service but that they would not be able to correct the aesthetic issues that occurred. Hard Knocks, WValtakis, jc57 and 1 other person like this. My guess would be some sort of pull through motorized device with a very coarse grit diamond wheel. It didn't touch the whole blade on the chef knife. Do all look like the chef? A real sharpener could fix that. Sadly things like this sully the trade. That would take smoothing the damage to a fine grit then a satin finish. If the scratches are too deep there may be some "scarring" to avoid wasting steel. That’s crazy.... is it just me, or is there a massive chip near the tip of that chef? That was my impression too, and I couldn't believe it. There is not a chip in the chefs knife but the edge is now no longer straight. It has dips in the edge from where pressure was irregularly placed on the knife while sharpening it. All of the knives are similarly damaged but the chef and the cleavers are the worst. I just don’t know enough about sharpening knives and specifically mechanical methods of sharpening knives. It looks like some kind of course grinder was used. How sharp are they? It looks like they were sharpened on the same gear used to do lawnmower blades. Honestly I can see some small handling scratches in a high volume setting, but for $ they shouldn't look a whole lot different than what they had when they were purchased. Nobody would buy kitchen knives off the shelf looking like that, which should be a baseline cosmetic/functional standard, and no it isn't normal coming from anyone remotely qualified. A new edge could be put on them, but any cosmetic repair to the primary grind will quickly cost more than the value of the knives. Also the fee was comparable to other places I checked. I paid $50 for 6 knives and assumed the methods of this 50 year old knife sharpening business would be similar to other places. The owner had the nerve to say any and all commercial knife sharpening companies would do it the same way. I said I was going to talk to the manufacturers and asked if he thought that they would think the same thing and he said yes. They are sharp but I wonder how long that will last. The owner had the nerve to say any and all commercial knife sharpening companies would do it the same way. Speaking as a commercial knife sharpener no way in hell would I have charged you that much nor jacked your blades up like that. Sadly I see lots of horrible damage from "sharpeners". As HeavyHanded said a pro sharpened knife shouldn't look much different, just cut better. I’m absolutely not a pro and would sharpen better than that. 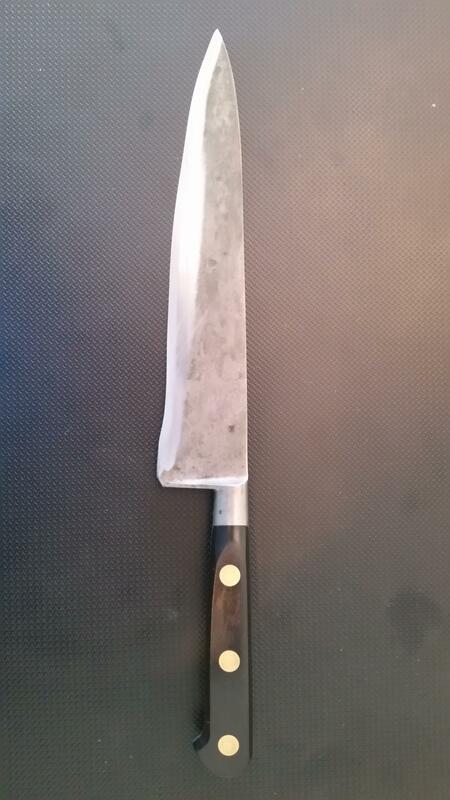 The Henckles doesn't even look as though it was sharpened all the way to the bolster, tho tough to say from the pics. If that's representative of commercial sharpening service, I need to start doing my commercial work blindfolded - and drunk. I will say that isn't the first time someone has posted up similar looking pics of their abused kitchen knives, so don't feel as though this is super extreme bad. It IS, but is also not unheard of. IDK what these outfits normally sharpen other than shovels that allows them to stay in business. I have a Deba that is beyond economical repair that would make you cringe. Chef's choice edge ? P60 grit?